Comments: Eastern cottontails have altricial young and shorter ears and legs than hares. During the day they may rest in "forms" or shallow depressions shaded by grasses. Occasionally, they use burrows dug by other mammals to escape severe weather. The underside of their tail and belly fur is white and their upper and side fur is brownish to gray. They forage in the twilight hours and at night. When danger is near they "freeze," and when threatened, make a zigzag dash to cover. If caught they emit a shrill scream. Breeding from early spring to late fall, females may produce 6-7 litters with 3-6 young per litter. Cottontails are an important food item for many predators. As a result, most rabbits die before they are a year old. Distribution: The eastern cottontail ranges from Central America through the eastern half of the United States and across the south-central border of Canada. They are found throughout Kansas in shrublands, woodlands, uncultivated croplands and gardens. 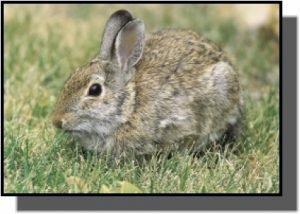 Food: Eastern cottontails feed on green vegetation, including grasses, flowers, garden vegetables and the bark of young trees in the winter.